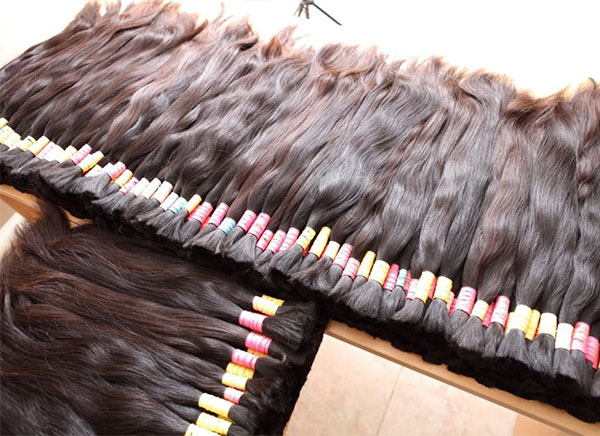 When you’re in the world of hair extensions, you’re bound to hear about virgin hair. It’s the highest quality hair out there, being both long-lasting and natural looking. But, what does the term even mean? Despite what many people think, “virgin hair” does not mean the same thing as “remy hair.” They are both high quality, but they are not the same thing. Virgin human hair extensions are made up of hair that meets a much longer list of criteria than the hair in remy extensions. First of all, 100% human hair must be used in the extension. No animal or synthetic hair should be found. Secondly, the strands of hair must all be running the same direction. This is important when it comes to taking care of your extensions. Now, these first two points of criteria are the same for human remy hair, but the rest aren’t. For example, in order for hair to be considered “virgin,” it must all come from the same donor. In addition, it cannot be processed at all. That means that no chemicals should touch the hair. It isn't dyed, bleached, permed, etc. Instead, it’s in its natural state. This is a huge difference from remy hair, which can be processed. Getting hair that meets such high standards sounds like such a hassle, so why do people bother? The simplest answer is that using virgin human hair extensions provides many benefits for the wearer. To start off, it’s the most natural looking type of extension on the market. After all, there’s nothing that looks more like real hair than real hair. To make things better, virgin human hair won't tangle like hair that doesn't have its strands all going the same direction. But even that isn't the best part. The most beneficial thing about having virgin hair extensions is that you can style them like you would your own hair. If you want your hair permed or dyed while extensions are in, you can go right ahead. You can blow dry it after showers, or take a flat iron it to the morning. Having virgin hair extensions gives you the freedom to do what you'd like without having to worry about ruining the hair. And, to add icing to the cake, if you take good care of your extensions, they'll last a long time. Depending on how you treat them, you may even be able to reuse them the next time you get extensions added. That’s definitely a wonderful bonus.